Synopsis: “Mark Wahlberg leads the cast of Contraband, a fast-paced thriller about a man trying to stay out of a world he worked so hard to leave behind and the family he’ll do anything to protect. Set in New Orleans, the film explores the cutthroat underground world of international smuggling-full of desperate criminals and corrupt officials, high-stakes and big payoffs-where loyalty rarely exists and death is one wrong turn away. 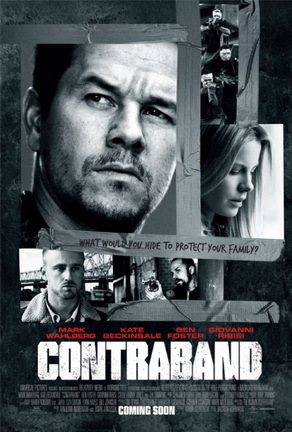 Chris Farraday (Wahlberg) long ago abandoned his life of crime, but after his brother-in-law, Andy (Caleb Landry Jones), botches a drug deal for his ruthless boss, Tim Briggs (Giovanni Ribisi), Chris is forced back into doing what he does best-running contraband-to settle Andy’s debt. Chris is a legendary smuggler and quickly assembles a crew with the help of his best friend, Sebastian (Ben Foster), to head to Panama and return with millions in counterfeit bills. Things quickly fall apart and with only hours to reach the cash, Chris must use his rusty skills to successfully navigate a treacherous criminal network of brutal drug lords, cops and hit men before his wife, Kate (Kate Beckinsale), and sons become their target” (United International Pictures). Verdict: All about an experienced but retired smuggler who is forced to get himself involved again – ah, we had quite a few films with the similar plot already, don’t we? Some were at least enjoyable but Contraband isn’t one of them. It’s cliche-ridden, boring and draggy. The second half of the movie is a little more tensed but the lack of realism just spoils it all. Even the action scenes are boring. Perfect role for Mark Wahlberg, one that didn’t require him to act much. Did Hollywood once again spoil a good film by remaking it, or is it actually this bad? We’d have to watch the original, Reykjavík-Rotterdam, to find out. The director of this remake, Baltasar Komakur, stars as the protagonist in that one. Two of the most unrealistic scenes: [SPOILER BEGINS HERE] First, it’s the scene where they rob the armoured van in Parnama. How in the world is it possible for Chris (Mark Wahlberg) and Danny (Lukas Haas) to escape from so many police and SWAT, without even getting shot at all? And not to mention that they accomplice are wide open at the back of the truck when fleeing. Second, how can one be still alive after being bagged in plastic for an hour at least? Not to mention that she lost a lot of blood? Kate (Kate Beckinsale) is probably not a normal human being [SPOILER ENDS HERE]. The ending: [SPOILER BEGINS HERE] Kate survives, Sebastian (Ben Foster) goes to prison, Chris and his team sell the goods to a buyer who then tells them about a robbed painting in Parnama that worth at least $2mil. Andy manages to purchase Gonzalo’s (Diego Luna) black van back from an auction which somehow still has the painting on it [SPOILER ENDS HERE]. Malaysian censorship: Nothing to censor besides the F-word, which they didn’t at all. Second opinion: “It’s not boring but sort of draggy” (Iris Loong). The invitation to the premier screening of the film was courtesy of ChurpChurp. i actually enjoyed this movie. although certain parts were predictable eg Sebastian being the rascal…but yes, I think I'll be getting this DVD when its released.